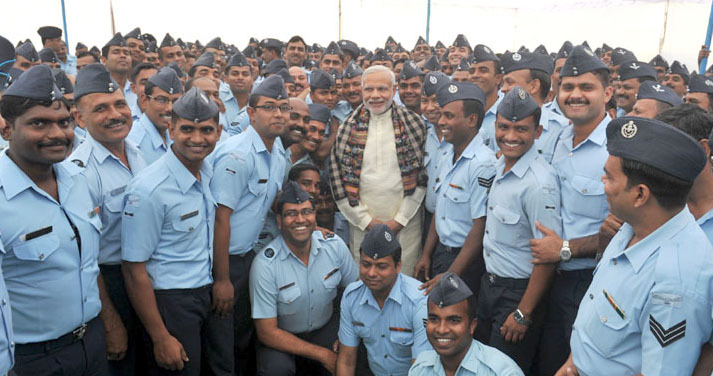 The Prime Minister, Shri Narendra Modi at Halwara Airforce Station, in Punjab on November 11, 2015. The Prime Minister visited the Dograi War Memorial, and the Barki War Memorial. The battles of Dograi and Barki were decisive successes achieved by the Indian Army during the 1965 war. The Prime Minister visited Asal Uttar, the site of one of the biggest ever tank battles, where the Indian Armed Forces achieved a major victory. The battle of Asal Uttar is remembered for the heroics of Veer Abdul Hamid, who was posthumously awarded the Param Vir Chakra. The Prime Minister paid homage by laying a wreath on the memorial of Abdul Hamid. The Prime Minister greeted and interacted with officers and jawans of the Indian Army and Air Force, at Dograi War Memorial, Barki War Memorial, and Air Force Station – Halwara. The Prime Minister said that everyone wishes to spend Diwali with his or her family, and therefore, just as he had visited Siachen last year, he has chosen to spend Diwali with the officers and jawans of the Armed Forces this year as well. He said that as this year marked the 50th anniversary of the 1965 war, he has chosen to visit locations where the brave soldiers of the Indian Armed Forces had shed blood and made the supreme sacrifice during that war. The Prime Minister said that the long-pending issue of One-Rank, One Pension has been resolved, and it has been granted. आज दादरी की घटना पर सब के सब ही रोये हैं, जली गोधरा ट्रेन मगर तब चादर ताने सोये हैं.